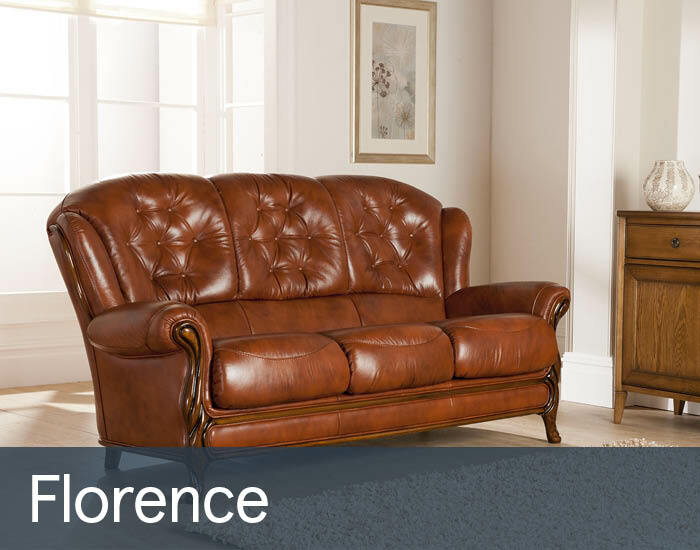 Florence is a classic, Italian showood collection of leather sofas and chairs designed very much with both style and comfort in mind. Its compact dimensions mean that whatever you choose, sofas or chairs, Florence will fit into most living rooms and tight spaces. Florence has great versatility being available in a vast selection of alternative colours, and also in fabric. Its ornate showood frame exhibits fine attention to detail and can be selected in a variety of different colours and 2 finishes – gloss or matt. The neatly buttoned, generous high backs have integral lumbar support meaning that neither your comfort nor support is compromised. If comfort is a priority, you can choose from manual or power reclining seats on the chair, with a neatly finished footstool also giving you the additional option of putting your feet up! Another attractive option of the Florence range is its quality foam seats, which are both removable and switchable – adding to both comfort and longevity of this time-preserved collection. When it comes to looking after you new furniture, Florence is easy to care for. We recommend that you wipe down your leather and showood trim with a barely damp, white cotton cloth used only for your lounge furniture. It can then be buffed up with a dry one. No detergents or polishes should be used, as this will degenerate the seal of the leather. Any spillages should be wiped up immediately, using a damp, white cotton cloth. If you need to use a soap, just use a very mild solution of pure soap.